Industrial products, which have been created by animal experiments, have no place in the earth. 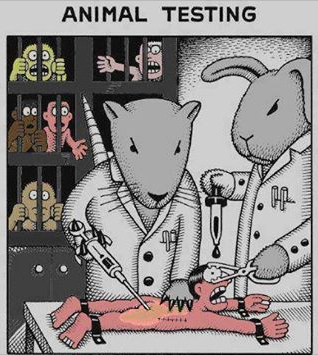 Mankind knows enough to make a living without animal experiments. The political argument that the chemical industry would safe work with animal experiments, this is a wrong argument, because at other places there is enough work to do which is never done, e.g. all the environment measures to save us from the collapse of the climate. We have to stop the torture with animals in favor of destructive capitalism. Humans never needed any animal experiment until before 100 years, and also today animal experiments are superfluous considering all wisdom about nature. God gave us all what we need to survive. There exist herbal cosmetics and there is natural medicine without any animal experiment. The political argument that chemistry would save "jobs" by produce products with animal experiments, this is a faked argument, because: When all humans would live naturally, so there were many jobs at other places to be done. By all this you see: Animal experiments are not needed.